Earlier this month, a study was [published] with a surprising result about the early history of dinosaurs. As we have previously discussed, dinosaurs come in 2 general flavors: Ornithischians and Saurischians [or maybe not]. Ornithischians include the diverse herbivores like Stegosaurus, Triceratops, Pachycephalosaurus, and others. They all have a predentary bone (a bone in the front of the upper jaw) and a pubis that points backwards (part of the hip). The predentary bone supported a beak for chopping plants and the backwards pointing pubis allowed for more space for guts – both necessary features for eating a lot of plants. Saurischians include the long-necked sauropods, and meat-eating theropods, like Tyrannosaurus rex, Velociraptor, Coelophysis, and others. They have a pubis that points forward and no predentary bone. 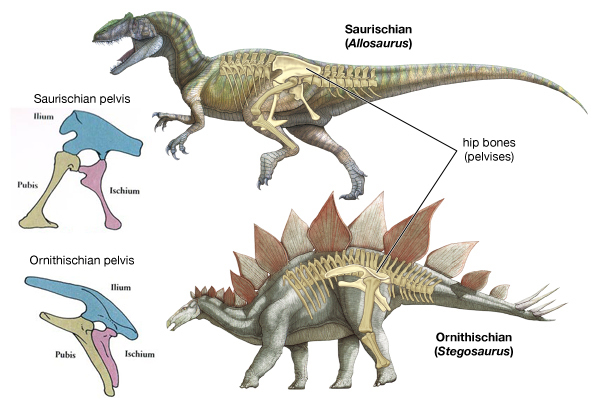 A comparison of saurischian (top) and ornithischian (bottom) hips. The pubis is in green. From Britannica and Everything Dinosaur. The early history of dinosaurs is a bit unclear partly because many of the earliest dinosaurs look very similar. This study examined a dinosaur named Chilesaurus diegosuarezi, which had been previously identified as a theropod. It has a backwards pointing pubis, but no predentary bone. This is not a combination that is seen in any other dinosaur. 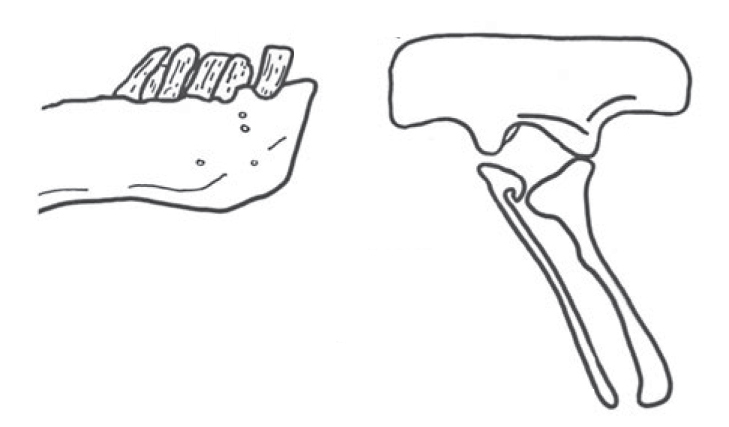 Figure 2 B and D from the paper showing the dentary (left) and hips (right) of Chilesaurus. The authors put Chilesaurus into a data set with 75 other dinosaurs and over 450 characters. The computer then ran a phylogenetic analysis (an analysis of evolutionary relationships) using the data set. Their new analysis concluded that this dinosaur was actually an early ornithischian and not a theropod! It shows us that the traits that helped ornithischians eat more plants evolved in stages and not all at once. First, the pubis turned backwards to allow for more gut space. Later on, the predentary bone formed and created a beak to easily chop plants. This analysis shows that sometimes we need to go back and retest our results to get a clearer picture of the past.